Singapore Boleh, Local Talent Boleh! The men’s long jump final at the ongoing IAAF World Junior Championships in Moncton, Canada, was concluded last night. South Africa’s Luvo Manyonga won it with 7.99m. Eusebio Caraces of Spain was second with 7.90m while Stewart Taylor of Canada took the bronze with 7.63m. It makes you wonder whether young Matthew Goh could have snared a podium finsih if he had been allowed to defer his national service and take part in the World Juniors. After all, he did set his national record of 7.62m at last December’s South-east Asia Games, and under national jumps coach Valeri Obidko, has been known to improve on his distances by 0.2m every year. You can read Deputy Prime Minister Teo Chee Hean’s response to Nominated Member of Parliament Joscelin Yeo on Mindef’s reasons for not granting Matthew’s request for a three-month deferment here. Yes, one can always argue that one can never tell if Matthew can set a new national record at the World Juniors, or even finish among the top-three. But then again, I wouldn’t have bet against him doing so given his annual rate of improvement, and the young man’s steely determination. This is another example of us shooting ourselves in the foot when it comes to Singapore sports. We will never know until we try, and yet we are not willing to give it a try. And I guess this is why Singapore sport can never go far. And when we fail to reach the heights, we lament, beat our breasts and complain that our sportsmen don’t have the hunger or the talent. And then we proceed to flood our sports with foreign exports. And when these naturalised citizens go on to win top honours, and when the general public doesn’t quite share in the manufactured joy, the authorities then slam the people for being ungracious, and for failing to recognise the sacrficies and hard work that these naturalised citizens have put in to achieve sporting glory for Singapore. Well, I am sure Matthew was also willing top put in the sacrifices and hours of hard work too. He just wasn’t given the chance because “the circumstances were not exceptional enough to warrant the granting of deferment”. Ladies and gentlemen, I have great news for you: Valerie Pereira is back and looking mighty fine on the track. The 20-year-old sprinter — who made people sit up and gape back in 2004 and 2005 with her national age-group record-breaking feats in the 200m before disappearing into oblivion — is back in action and judging from her lastest time, firmly on track to realising her potential as one of Singapore’s best female sprinters since Prema Govindan. According to my sources, she clocked a stunning 24.86sec in the 200m heats in the Vietnam Open today to qualify for the final. That’s just 0.32sec shy of Govindan’s national 200m record of 24.54 set in 1984. If I am not mistaken, it also makes her the first Singapore woman sprinter since Govindan to clock a sub-25sec time. Track and field enthusiasts have been waiting far too long for Valerie to achieve this sub-25sec timing. Many of us, in fact, thought she would do it in 2006 after she, at the tender age of just 15, recorded a new national Under-17 record of 25.14 in November 2005. But sadly, that breakthrough never came as Valerie spent the next few years in the athletics wilderness as she lost her form and momentum, and quite possibly her motivation. But things have been looking up for her ever since she returned from Germany at the end of 2009 (where she spent almost a year training with Rainer Paul, her former coach from the Singapore Sports School). I understand that she’s been training with local coach and Wings Athletics Club president Melvin Tan since her return. My sources also tell me that Tan was quietly confident that Valerie would start chalking some spectacular times by July and indeed he has been proven right. I am so happy to see that Valerie is back. I had feared that she had burnt out and that we would never see her realise her full potential as a 200m and 400m specialist. Valerie will be running in the 200m final tomorrow morning and I will be keeping my fingers crossed that she will break Govindan’s record. But even if she doesn’t, I will be very happy if she can clock another sub-25sec timing. Because that means that the national 20om record is going to go down sooner or later. Great job, Valerie. All the best in the final. I can’t wait to hear from my sources tomorrow. Valerie finished third in the 100m final this morning. She clocked a very decent time of 25.18sec. My heartiest congratulations to her. THE court yesterday ruled out putting a 16-year-old boy on probation for punching a student after a fractious inter-school rugby match. Chan Yu Tat, formerly of St Andrew’s Secondary School (SAS) and now working as a part-time packer, will instead be assessed for tougher reformative training. Community Court Judge Ng Peng Hong told the court that he had been ‘alarmed’ by the probation report, and said the teenager needed a structured environment to address his ‘delinquent lifestyle’. 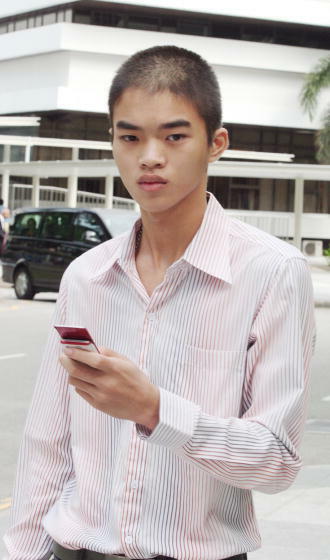 Chan Yu Tat, 17 yrs-old accused for assaulting an ACS student at a bus stop after the school B division ruby match final. Picture taken from http://www.straitstimes.com. If Chan is put on reformative training, he will go through a tough regimen of foot drills, counselling, education and vocational training for between 18 months and three years. On the other hand, being put on probation, usually for two years, would have meant his being able to carry on with school or work while living at home; he would have a probation officer to check on him. The court heard earlier that Chan had, on April 12, approached a 15-year-old student from Anglo-Chinese School (Independent) after a keenly contested rugby match between their schools and punched him in the face. The ACS (I) student fell and broke his nose. A second similar charge against Chan for punching another ACS (I) boy will be considered when he is sentenced on July 30. All three boys were not rugby players but supporters of their teams. The match that ACS (I) won 8-7 was also marred by a fracas on the pitch, in which an SAS player hit his opponent. Supporters from both sides then invaded the pitch. The Singapore Schools Sports Council is investigating the incident. I had written about this young thug back in April. You can read it here. And I am glad that the authorities are strongly considering tougher reformative training for him as punishment. I can only imagine the sort of trauma he must have caused those two unsuspecting Anglo-Chinese School (Independent) whose only crime was to support their school at the rugby final and be seen at the bus-stop in their school uniform after the game. I do not hope for this chap to suffer any trauma. That would be self-defeating. But I do hope he will learn some painful lessons from this and that the punishment will help him to turn over a new leaf. Another national open record broken at National Schools T&F C’ships | The Singapore Sports Fan Says... on Well done, Chan Sheng Yao!